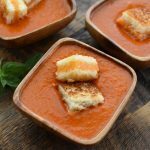 Pure comfort food classics like tomato soup and grilled cheese get an upgrade with this creamy homemade version. Preheat oven to 400F. On a large baking sheet add all the tomatoes and toss with a little olive oil. Roast the tomatoes at 400F for 25-30 minutes. Take them out of the oven and let cool. Peel all the tomatoes, and discard the skins. In a large pot, add butter, onion, celery, and dried oregano. Cook until onions and celery are translucent. Add peeled tomatoes, basil pesto and honey. Cook in the pot for a few minutes. With an immersion blender, blend it all until smooth. Finish by stirring in the heavy cream. Continue cooking on medium low for another 15 minutes or so. Serve with grilled cheese sandwiches or croutons. Enjoy! *When tomatoes are in season, use fresh tomatoes! *We love to make homemade basil pesto ahead of time and freeze it to be used in this recipe.